The Grains Farm Biosecurity Program (GFBP) is an initiative to improve the management of, and preparedness for, biosecurity risks in the grains industry at the farm and industry levels. Launched in 2007, the program is managed by PHA and funded by growers through Grain Producers Australia together with the New South Wales, Queensland, South Australian, Victorian and Western Australian governments. Grains Biosecurity Officers in these five states develop and deliver materials to raise awareness and training to growers, consultants and other industry stakeholders. PHA manages the national program and assists officers to deliver key messages by producing communication tools such as farm gate biosecurity signs, fact sheets, media releases and pocket guides. For more information about the Grains Farm Biosecurity Program contact Stuart Kearns, Manager, Farm Biosecurity Programs, on 02 6215 7739, email biosecurity@phau.com.au, or visit Grain Producers Australia. With zero market tolerance for live pests in grain, storage is no time to forget about biosecurity. 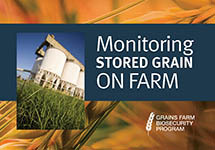 Working closely with grains storage specialists, the Monitoring stored grain on farm booklet pulls together information from a number of other resources, complementing those already produced by the GRDC Grains Storage Projects. The booklet also contains a phosphine record keeping sheet for silo fumigation activities. 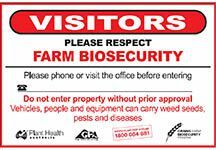 Signs can be used to indicate to visitors the importance of following biosecurity procedures on your property. This template can be downloaded and used to print a 900 x 600 mm gate sign. Remember to include contact details in the space provided. Information about the grains industry in Australia, biosecurity plans, manuals, fact sheets and pest documents are available on the grains industry page.